Vihik Cabs is an artificial intelligent chat bot-based cab booking service, which lets drivers and riders negotiate the price for every ride. There are two clear leaders in the cab aggregator space in India – Ola and Uber, both commanding nearly 50% each of the market. Other players like Meru and UTOO are also trying to capture this space but have only a minuscule share of the pie. However, even though both Ola and Uber are the most widely used apps, they have their share of criticism. Most often, it is to do with surge pricing and sometimes issues with the quality of drivers and the cabs, something the newer players try to capitalise on. UTOO cabs for example owns its fleet to ensure the quality of cabs and also has a policy of never charging a surge price. There is now another startup based out of Hyderabad, which is trying to take on the established players in the cab aggregator market with its innovative business model that focuses on giving both drivers and riders more choice in terms of pricing and who they ride with. Founded by Husband-wife duo Chaitanya and Sameera Duddu, Vihik Cabs is an artificial intelligence (AI) chat bot-based cab booking service. The idea came after they saw the problems that cab drivers faced in the light of reduced incentives and increased strikes and the problems faced by customers due to surge pricing. “When we came back to India in 2015, we did some research and got feedback from around 200 customers that people are fed up of Uber and Ola and would like an alternative to address their pain points,” Chaitanya says. The main differentiation Vihik cabs offers is that there is no fixed pricing for cabs. It gives drivers the option to decide the price they want to go by, something they can even change through the day. “We provide bidding options to negotiate trip price with cab drivers and allow bi-directional communication for negotiating trip prices on the tap of a button. And to solve the problem of cab drivers not being in control of price per kilometre, cab drivers are given the option to change price per kilometre in real time and also allowed to take whatever trip they want,” he says. While this brings up the issue of drivers charging exorbitant prices at all times for their personal profit, Vihik cabs also has a bidding platform where drivers and riders can negotiate for the best price. Riders too can send a trip request mentioning the amount they want to ride with, which goes out to the drivers, who then come onto the platform to negotiate and arrive on a mutually agreeable price. “The whole bidding process currently takes two minutes but we are working to get that time down soon,” Chaitanya says. And to avoid exorbitant pricing, there is a cap on the driver who is able to charge a maximum of Rs 35/km. Another major problem riders face is the quality of drivers. There have been instances of rude behavior, assaults and though there is a rating system, riders don’t get the choice of picking the best rated drivers. Vihik Cabs claims to solve this problem by giving customers the option to select the driver. Drivers are listed on the app by ratings and price. Cab aggregators such as Ola have also been tackling the problem of poor internet connectivity and it has launched its light web app. 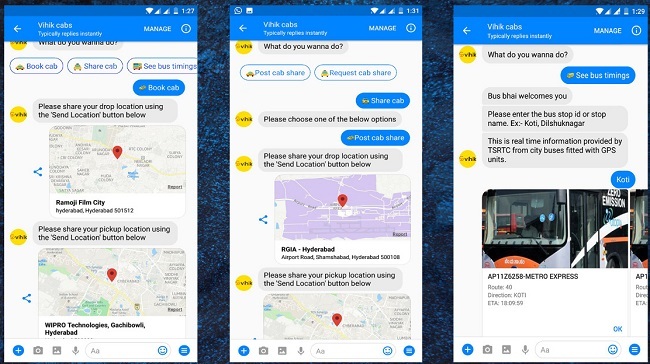 Going one step further to tackle the problem of those unable to book cabs because of either bad network connectivity or huge app sizes where customers don’t have enough storage space on phone, Vihik Cabs has a Facebook chat bot on Facebook Messenger, which lets customers book cabs or pay for a cab ride without installing the app. The basic model of Vihik Cabs is similar to that of Uber and Ola in the sense that it is an aggregator and doesn’t own any of the cabs. It charges drivers a commission of 20% on each ride. Uber charges anywhere between 25%-30% while Ola takes 25%. Since it started operations in June 2017, it has so far garnered 8,000 customers across its iOS, Android apps and Facebook chat bot. It has 300 drivers on board in Hyderabad and has been doing over 100 trips every month. The target is to reach 1,000 drivers and one lakh customers by the end of this year. It will then bring auto rickshaws onto its platform. By the end of this year, it plans on entering Mumbai and Chennai. It will then look at entering other southern markets such as Kerala and Bengaluru and will look at expanding to the North next year, starting with Delhi. It is also looking at expanding into the B2B segment next year. “Big companies have to deal with multiple vendors for cab, flight and hotel booking and even to manage parking. We are going to integrate a chat bot into Skype or Slack in companies, which will work as a command centre and also eliminate middle vendors. 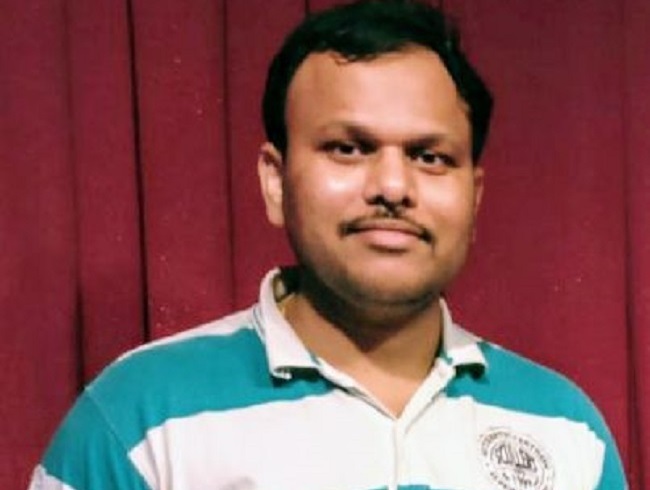 This chat bot will save time too, by throwing popups on chat windows for managers to accept trips in real time by reading their emails from Office 365,” says Chaitanya. However, unlike Ola and Uber, which spent millions of dollars in customer acquisition, Vihik Cabs has taken a more modest route. “We did Facebook marketing to market our startup. We also used Instagram and YouTube influencers that have significant user base to promote Vihik Cabs. Additionally, we also recruited interns from colleges who act as ‘campus ambassadors’ to talk about Vihik Cabs in their colleges,” Chaitanya says. Having spent Rs 10 lakhs on its business so far, Vihik Cabs is up against aggregators that have not only established themselves as brands but are also deep pocketed, thanks to their big-ticket investors such as SoftBank. “We can’t beat them in customer acquisition in the next three years at least. But over the next five years, the market will evolve and see a lot of changes. We want to eventually consolidate our position and be the second or third biggest player. Basically, we want to be the alternative to cab bookings,” he says. He adds that he is confident that they can successfully grow for the next five years. With most industries seeing consolidation as they mature, Vihik Cabs too says it will be open to acquiring other players that would have decent customer base. If it is able to raise enough funds, an acquisition could be on the cards, Chaitanya says. Having bootstrapped so far, it will be looking to raise funds over the next six months to be able to fund its grand acquisition plans.